Crown Isle Golf Resort will stand out in your memory as one of those unique places on the golfing globe. Crown Isle Golf Resort in Courtenay is tucked under the shadows of the massive Comox Glacier and the beautiful Beaufort Mountains. The resort is located just five minutes away from an international airport and forty minutes from the Island’s top skiing destination. The clubhouse is equally dazzling. The 48,000-square-foot West Coast creation includes a pro shop, family friendly bar and grill, and banquet rooms. The adjacent Villas at Crown Isle, which have been awarded 4½ stars stars by Tourism B.C., are some of the most luxurious on the Island. British Columbia's newest must-play golf destination. The Courtenay-Campbell River Golf Weekend is an unforgettable golf getaway in BC's hottest new golf destination! Play 6 of the best golf courses on Vancouver Island, and stay 6 nights (2 nights in each destination). This is a week of golfing heaven! When only the best of the best will do, this is the vacation for you. Six nights in unforgettable accommodations and rounds of golf at six of the best courses on the island. This is truly Canada's Greatest Golf Trail! Two nights at the Westin Bear Mountain Resort, two nights at Crown Isle Resort, and four rounds of golf with shared power carts. 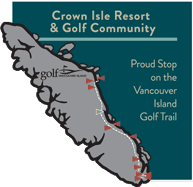 Two nights at the superb Crown Isle Resort and rounds of golf with power carts at Crown Isle, Storey Creek & Quadra Island golf course. This is phenomenal golf package to one of BC's top golf resorts. When you can't decide which ones to play, why not play them all! Spend two weeks golfing the thirteen courses on the Vancouver Island Golf Trail. This is island-time golfing at its best! Three nights at the incomparable Crown Isle Resort and rounds of golf with power carts at Pheasant Glen, Crown Isle, Storey Creek and Fairwinds. This is a getaway you won't soon forget! Two nights in an incredible one-bedroom suite with jacuzzi tubs, and two rounds of golf with power carts. Next to giving mulligans, this weekend escape is the best way to reconnect with that special someone! The golf course matches the quality of the rest of the resort and stretches 5,200 yards from the forward tees to over 7,000 yards from the championship tees. While Crown Isle is mostly a forgiving resort-style course with wide, rolling fairways and subtle undulating greens, don’t be lulled into a false sense of security. For instance, the fourth hole is a testy, 163-yard, par three over water. Hit it to the middle of the green and you’ll be fine, but take on the sucker pin placement tucked near the front edge of the green, and your ball could easily catch the false side and end up at the bottom of the pond. The fifth, a 502-yard, par five, is another hole to play smart. Water runs down the right side and the out-of-bound stakes guard the left edge of the hole. To make it even more interesting, the fairway gently rolls like an ocean swell so there are frequent challenges. Crown Isle ends with its signature eighteenth, a 423-yard monster with bunkers both off the tee and guarding the front of an elevated green. Crown Isle is the BC golf course that is on everyones must-play-again list. The Emerald Club digital newsletter is emailed 8-10 times per year offering golf travel deals and interesting information about golf on Vancouver Island. You may unsubscribe at any time.